And the cares of this world, the deceitfulness of riches, and the desires for other things enter in and choke the word, and it becomes unfruitful. 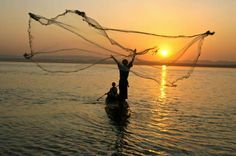 The art of casting nets to fish has been used for thousands of years! The type of net used is circular with small weights attached around its edges. The fisherman throws the net in such a way that it spreads out onto the water and sinks. Fish are caught as the net is hauled back to shore. The disciple, Peter, was himself a very successful fisherman when Jesus called him to be one of the Twelve. In his writing of 1 Peter 5:7 he uses the analogy of “casting” in a unique way. Cast all your cares upon Him for He cares for you. Peter knows one of life’s secrets: It is to be carefree! It is to laugh – to enjoy simple things – to leave your worries behind you! Like children, we have hearts that dance! Clutching nothing in our hands . . . In God’s economy, one of our greatest possessions is to know Peace! So, we relax and let go. Like the net that sinks way out in the water, we cast all our cares away from us and onto Him! Thank you Lord – that you bear all my burdens . . . I was never meant to bear them. I hide myself in You. I release every oppressive thought into Your loving hands. Thank you that I possess Your Peace!